Parents can be so clever. Take this mom who created the You Got Grounded game for her child. How nice of her! 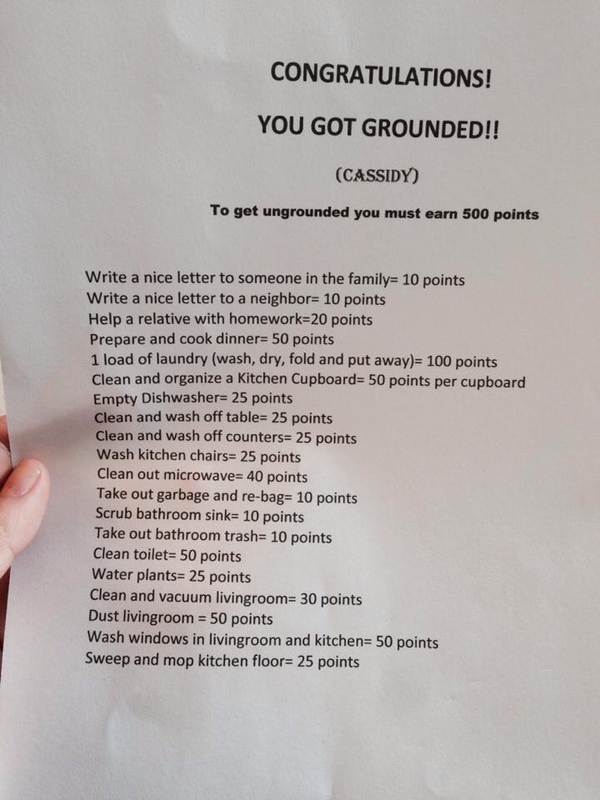 In order for the kid to get ungrounded, they have to perform a series of chores that add up to 500 points. They can clean out the microwave for 40 points, sweep and mop the kitchen floor for 25 points, do one load of laundry for 100 points (mom must really want that), or write a nice letter to someone in the family for 10 points. We're really liking the sound of this You Got Grounded game! Imagine all the household chores you could get done when your child misbehaves? Once the kid gets old enough, the You Got Grounded game could include such boring tasks as going to the grocery store, paying all the bills, or talking to your mother-in-law while telling her that you're out running "errands." The possibilities of the You Got Grounded game are endless! Parents, we suggest you share this funny grounded photo ASAP so the game catches on and kids everywhere start behaving. Parents can be so clever. Take this mom who created the You Got Grounded game for her child. How nice of her! In order for the kid to get ungrounded, they have to perform a series of chores that add up to 500 points. They can clean out the microwave for 40 points, sweep and mop the kitchen floor for 25 points, do one load of laundry for 100 points (mom must really want that), or write a nice letter to someone in the family for 10 points. We’re really liking the sound of this You Got Grounded game! Imagine all the household chores you could get done when your child misbehaves? Once the kid gets old enough, the You Got Grounded game could include such boring tasks as going to the grocery store, paying all the bills, or talking to your mother-in-law while telling her that you’re out running “errands.” The possibilities of the You Got Grounded game are endless!